Call someone you trust! Johnson and Johnson Locksmith and Door Company is a certified provider! Get the help you need from a professional and reliable team! Johnson and Johnson Locksmith and Door Company provides a wide range of services for you home, auto, business, or residential needs. As a side note we have been offering these quality services for over 21 years! You can’t always plan when you need help. Call to find out about our after hours service options. You can’t always plan when you need help. Call Johnson and Johnson for after hours service options. 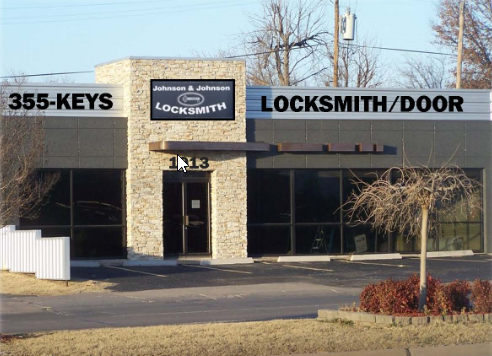 Johnson & Johnson Locksmith/Door Co. is a veteran-owned family business established in 1996. We maintain the highest integrity and customer service standards and have been providing them for the past 17 years. Our company and our technicians are responsible, hardworking, and honest. We provide a quality service at Johnson and Johnson Locksmith and Door Company. We stand behind that service as well! You can’t always help when you need help or service. Give us a call if you need after hours service options! We take pride in serving Lawton and the surrounding areas for over 20 years. We have the experience needed to tackle your lock and door needs! We provide excellent service to all customers! Johnson and Johnson Locksmith and Door Company provides a wide range of services. A few of our primary services are listed below but we do so much more! We offer a wide variety of locksmith services. For home, business, or auto we have you covered. We provide a excellent selection of safe services. Call today and ask about our Safe sales and services. We can get you back in quickly and professionally! Cars, Homes, or Businesses give us a call! Let us help with your access control needs. Control who has access and who doesn’t. Let Johnson and Johnson Locksmith and Door Co. install commercial doors and hardware for your business. For dependable access you can trust choose Johnson and Johnson Locksmith and Door Company. Do you need help with our services? Fill out this form to get in touch.